UNDER-17S: #LimerickFC are also in the action in the U17 Southern Elite Division against @ShamrockRovers today. Kick-off in Tallaght is 2pm. As per the teamsheet, #LimerickFC will wear their away strip of green jersey with black shorts. 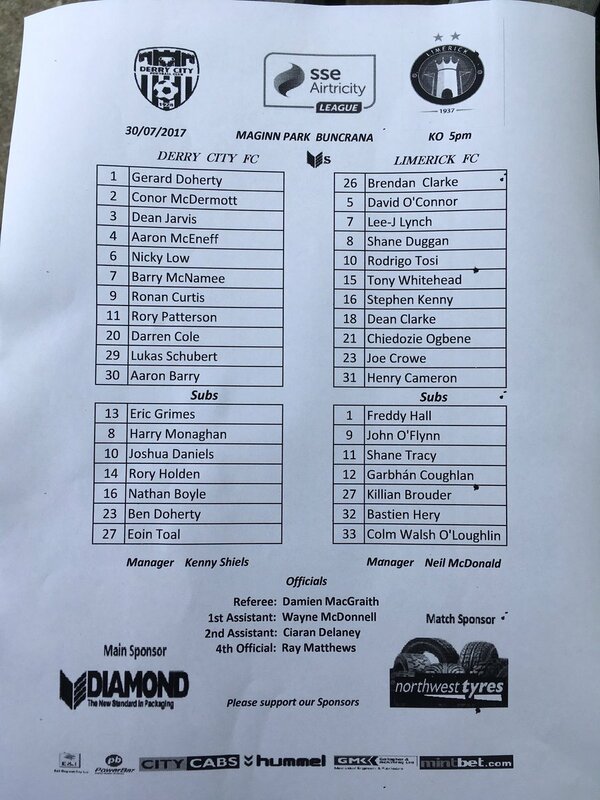 DERRY CITY v #LimerickFC: Doherty, McDermott, Cole, Barry, Jarvis, McEneff, Low, Schubert, McNamee, Curtis, Patterson. Derry City Subs v #LimerickFC: Grimes (GK), Monaghan, Daniels, Holden, Boyle, Doherty, Toal. 1: Goal: @derrycityfc 1-0 #LimerickFC. Bad mistake at the back and McNamee rounds the 'keeper to score a tap-in. 9: Goal: @derrycityfc 2-0 #LimerickFC. Neat build-up play sees a pull-back to Patterson 20-yards out and he slides it to the bottom corner. 32: Quick break from #LimerickFC ends with Kenny's low shot from outside the box gathered by Doherty (0-2). HALF-TIME: @derrycityfc 2-0 #LimerickFC. Early goals from Barry McNamee and Rory Patterson put Limerick on the back foot. Since settled. 58: Double Sub for #LimerickFC: Rodrigo Tosi is replaced by John O'Flynn; Henry Cameron makes way for Bastien Héry (0-2). 68: Little happening here in the second half. Derry with plenty of possession and Patterson has just driven over from inside the box (0-2). 78: Caution: Stephen Kenny booked for a foul as Derry broke following a #LimerickFC corner (0-2). 85: Goal: @derrycityfc 3-0 #LimerickFC. A cross to the back post is miscontrolled by a Limerick defender and Ben Doherty fires in. 90: Sub for #LimerickFC: Colm Walsh-O'Loghlen comes in for his debut in place of Kenny. Three minutes added (0-3). FULL-TIME: @derrycityfc 3-0 #LimerickFC. 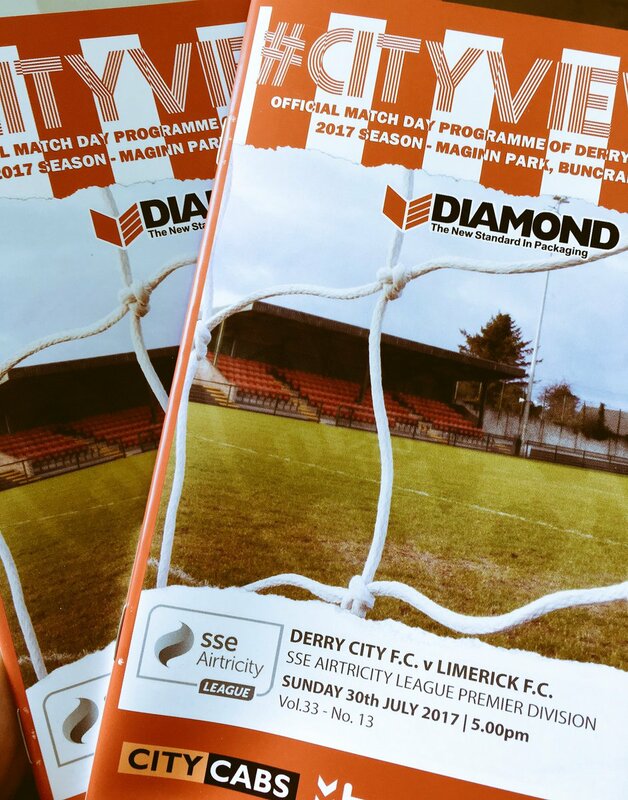 Goals from McNamee, Patterson and Doherty give Derry comfortable win where defensive mistakes hurt.